A few years ago, I heard about Jessi from Naptime Diaries. I was directed to her shop which had super cute prints with scripture on them. They were super gorgeous and definitely worthy of being hung on many, many walls. I had the chance to meet Jessi two years ago when I attended the first Influence Conference. And let me just tell you, this girl has one of the biggest and most beautiful hearts of anyone I've met. Her talk at the conference about wretched me; in a really good way. I honestly cannot say enough good things about sweet Jessi! She emailed me at the beginning of the year, and asked if she could turn my Verse of the Year into a canvas that she would then sell in her shop. I sent her my verse plus the colors I liked, and it seriously couldn't have been anymore me! I wept when I got it in the mail, which is very unlike me. 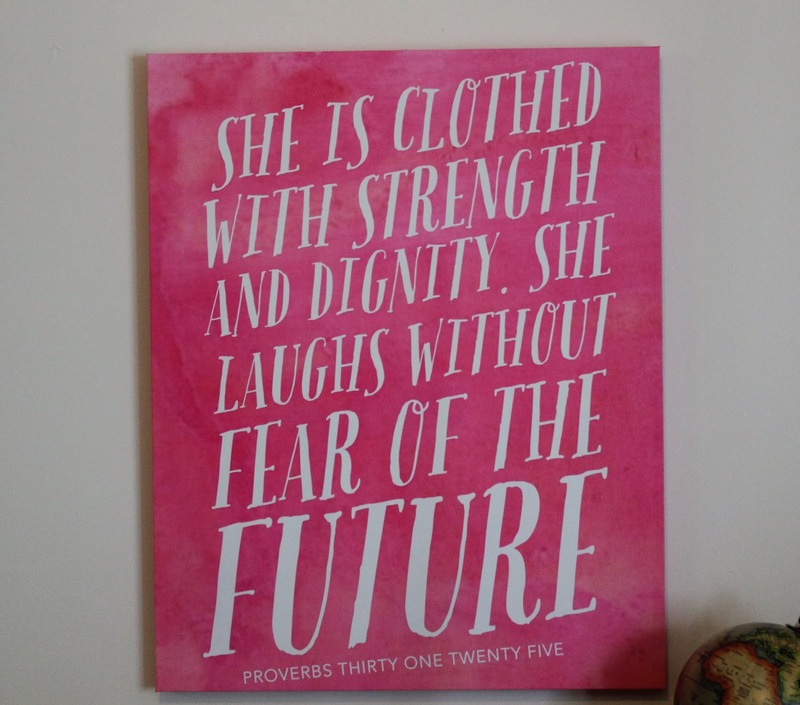 I picked Proverbs 31, because I have so many fears about the future. I feel like I've been in a season of waiting, and it has served as a good reminder that God is in control and there is not reason for me to have fears about the future. So I find so much freedom in the reminder that God is in control. It's currently hanging in my living room, which I love the pop of color against the wall. I'm planning to rearrange my office when I get home from Paris and will then hang it permanently in there. I seriously just love it for so many reasons. I highly suggest that you run, not walk, over to her shop and check out some of her fabulous prints! She is offering 15% off to all my lovely readers with code Caroline G Shop. Tell me what your favorite print is! loved reading this! and love your heart to live a life the Lord will be proud of! there are great things in store friend and i hope and pray i'll be on the journey to see them unfold!